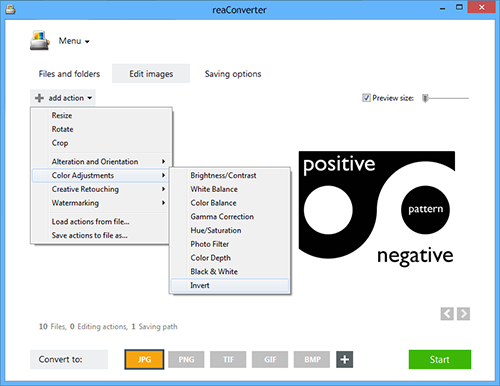 In case you like to experiment with colors in your images or add a creative twist while editing your digital photos, reaConverter provides an easy-to-use interface that helps you do batch editing in a matter of seconds. One of the popular image handling tools featured by this powerful software allows inverting colors in an image. Color inversion makes images look like their photo negatives, where each color is replaced by its complementary correspondent — for example, black becomes white, green becomes magenta and blue becomes yellow. Color inversion turns the lighter parts of the photo into darker ones, and vice-versa. This ensures a complete color reconfiguration and reinvention of the photo, adding more visual appeal. Load all the photos you intend to edit. Add them manually, use the drag-and-drop tool or load them from a text file. Clicking on this option will automatically invert colors in your images. If you have entered several files, you can check the effect of this editing feature in each of them by clicking on the arrow buttons placed in the lower part of the Preview area. 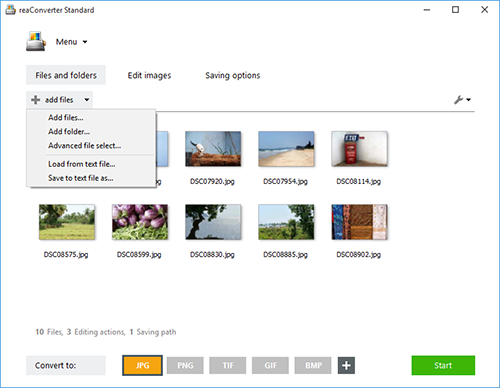 In the Saving options tab, pick one of the available possibilities for saving the output images locally — in the source folder, a new subfolder, or in a customized location. reaConverter's latest edition also allows you to save output images online, directly in your Google Drive or Box.net account, among others. Last but not least, decide if you want to preserve the input format of your images or convert to a new one. 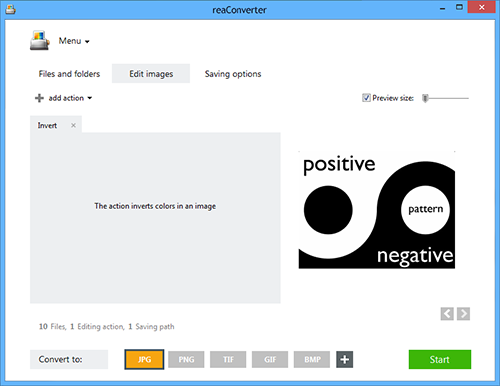 reaConverter supports a large number of image extensions. Simply click on one of the buttons that stands for your desired format (placed in the lower part of the window) and then press Start to complete the editing and conversion process. Command-line inversion tool is an advanced feature meant for professional use, and is available in Pro edition only.